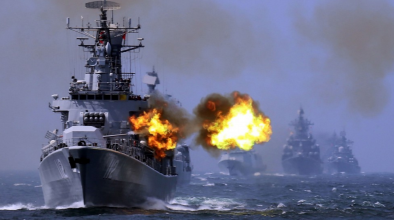 China’s Defence Ministry confirms that China and Russia will hold “routine” naval exercises in the South China Sea in September and the drills were aimed at strengthening their cooperation and were not aimed at any other country. The exercises come at a time of heightened tension in the contested waters after an arbitration court in the Hague ruled this month that China did not have historic rights to the South China Sea and criticized its environmental destruction there. China rejected the ruling and refused to participate in the case. China and Russia are veto-wielding members of the U.N. Security Council, and have held similar views on many major issues such as the crisis in Syria, putting them at odds with the United States and Western Europe. For the record, Last year – they held joint military drills in the Sea of Japan and the Mediterranean. Russia has been a strong backer of China’s stance on the arbitration case, that was brought by the Philippines. “These drills deepen mutual trust and expand cooperation, raise the ability to jointly deal with security threats, and benefit the maintenance of regional and global peace and stability,” he said.